Rather than review these books individually, I wanted to write some comprehensive thoughts I had after reading both. To familiarize you on each book, though, I’ll provide brief backgrounds/plot summaries. OCDaniel follows the story of Daniel, a middle schooler (I think?) who is trying to fit into his group of friends but is plagued by intrusive thoughts and compulsive behaviors that he doesn’t understand and cannot control. He loves to write and gets some relief from that, and eventually he finds himself caught up in trying to solve a mystery with a girl from his school who deals with her own mental health issues. Eventually, she helps him realize that he has OCD and that help is available. In Turtles All the Way Down, the protagonist, Aza, also has obsessive compulsive disorder though I’m not sure Green ever actually uses the diagnosis as such anywhere in the book. She goes to therapy and is prescribed medication, though her commitment to both are lacking. Aza similarly finds herself caught up in a mystery of a missing person, who happens to be the dad of an old friend (and her eventual love interest). I am grateful to both books for their candid and very well written descriptions of what it is like to live with obsessive compulsive disorder. 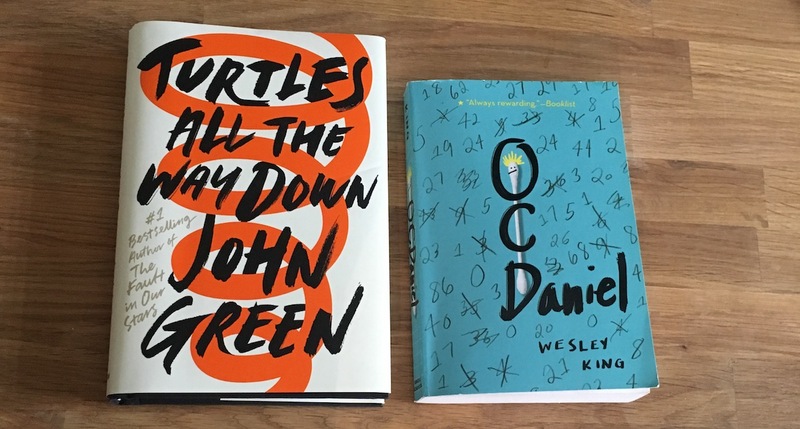 Both Wesley King and John Green have personal experience with OCD, and this allows them to clearly and beautifully create prose that puts into words what it is like to have obsessive thoughts. To me, King’s descriptions are more heartbreaking. Maybe it’s because he is writing from the point of view of a child who is dealing with the obsessions on his own without knowing what they are. I’m sure those of us with OCD have been there, or at least been somewhere similar before we got diagnosed or realized what it was that we were up against—that feeling as though we are fighting an impossible and losing battle with our own minds. Green, on the other hand, writes from the point of view of a teenager who knows that she has a mental illness. He pits the “OCD voice” against Aza’s own voice, with the OCD’s demands and reasoning in italics and her own in plain text. At one point there is over an entire page of the book chronicling this battle between Aza and the OCD, and it really does capture the back and forth reasoning that so often occurs. In Aza’s case, the OCD pretty much always wins, and she gives into its demands. Of course, things usually go badly for her as a result. I won’t go into too much detail, so as not to give anyway any spoilers for either book, without saying that they are both well worth the read. They detail extremely well what it is like to live with OCD, and not just in regards to obsessions (which can be really difficult to describe and put into words). The description of the compulsions are also amazingly done because they don’t fall into the trite, stereotypical views of someone with OCD being super organized or clean. Yes, Aza in Green’s book does have contamination OCD, but she is mostly worried about bacteria rather than over-washing her hands. She causes physical harm to one of her fingers by pressing on it too much, and even just that small inclusion is a great reminder that OCD often causes physical side effects that people overlook or don’t think about at all. Even those who over wash their hands aren’t just left with really clean hands—often their hands crack and bleed, becoming even more “dirty” as a result. I appreciated Green showing that OCD’s compulsions don’t actually solve problems or make sense logically. Aza’s compulsion in using hand sanitizer in various and unhealthy ways does not protect her but actually proves to cause more issues, as do most of the compulsions that OCD tells us will “help.” He also shows that the compulsions don’t align or make sense. Aza isn’t concerned about her legs getting dirty in a filthy river water, for instance, though she becomes worried about the cut in her finger having gotten contaminated from the water. In regards to OCDaniel, his routines and compulsions are also so well documented. He has an intense bedtime routine that involves very specific things that he must do in a specific order or for a certain amount of time. King tragically describes how sometimes Daniel spends hours doing his routine because he has to start the entire process over after one thing goes wrong, whether that is him using an extra square of toilet paper or brushing his teeth a few extra moments. Similarly, Daniel often gets “trapped” in turning off his light and finds himself stuck in a seemingly endless loop of switching the light off and on, over and over again. His sleep and sanity obviously suffer as a result of his OCD, and he is left feeling hopeless and debilitated by his own mind. So, while plots and protagonists were different, both authors really accurately described the many different ways the OCD can invade and take over not just a person’s brain but his or her life as well. For teenagers with OCD, these books are so valuable not just to show that they are not alone but that there are so many variations in OCD and how it manifests. However, while I found both books completely worthwhile, I felt like they began the journey without finishing it. They were heartbreaking but not hopeful. They showed how OCD can destroy and affect life negatively without telling the reader that there is hope and that obsessive-compulsive disorder is something that can be managed and successfully controlled. OCDaniel hints at treatment near the end but doesn’t fully develop and explain it. Turtles All the Way Down has Aza going to therapy, but she can’t commit to exposure response therapy and refuses to engage in it. She also repeatedly talks about how she feels like taking medication is a cop out or somehow isn’t right because you shouldn’t have to take a pill to become who you are. While I am sure that many teenagers feel this way and know of many individuals who don’t want to take medication or can’t commit to doing cognitive behavior therapy, I was still really disappointed with this aspect of Turtles All the Way Down. Yes, it’s accurate. Yes, people feel like that. However, Green had an amazing opportunity to use his massive audience of a best selling book to explain and show how therapy and medication are so incredibly useful and can make life livable and positive when you have obsessive compulsive disorder, rather than just ending the book on a frankly depressing note. Even an epilogue about therapy and medication would’ve been really awesome. I feel like that was a massive missed opportunity, and its omission was almost a stab in the back to organizations like iOCDf and countless mental health advocates who are trying so hard to promote help and awareness of treatment for mental illnesses like OCD. Overall, yes, you should read these books and promote them with the post script that help is available and hope is totally real. We can live with OCD. It is not a death sentence. It is not a tragic character trait but something that we can manage. We can write our own stories without letting OCD be the main character. Have you read these books yet? What were your thoughts?